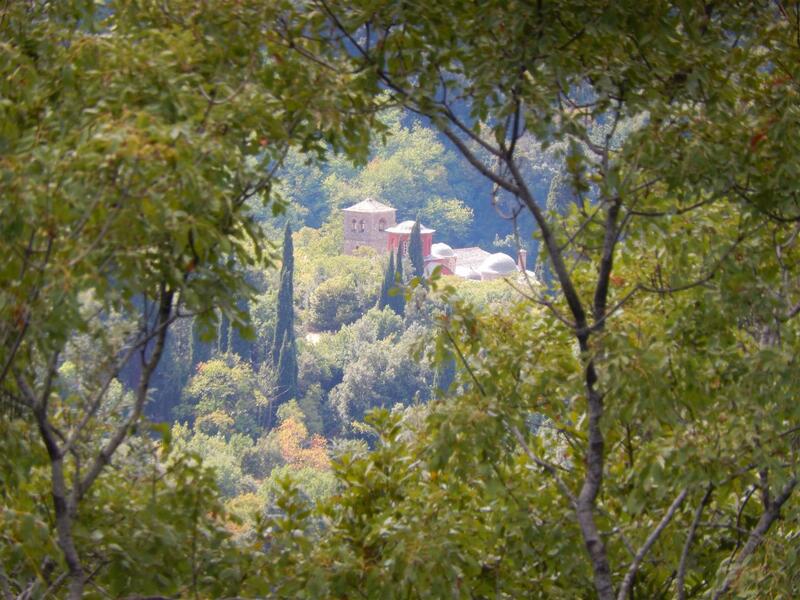 Most paths on Mount Athos are either well kept by the Friends of Mount Athos (FoMA) or they are in a deploreable state, because no one ever walks them. 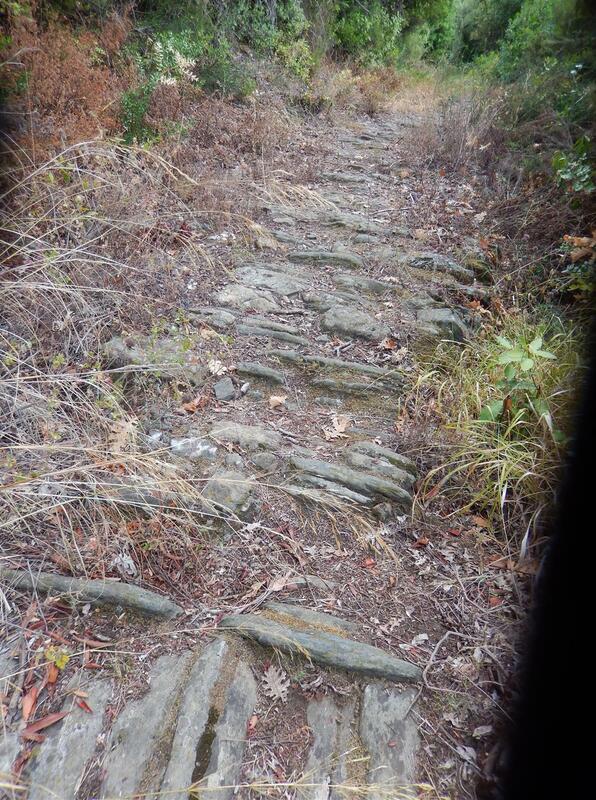 Most of the time these paths totally disappear within a couple of years. 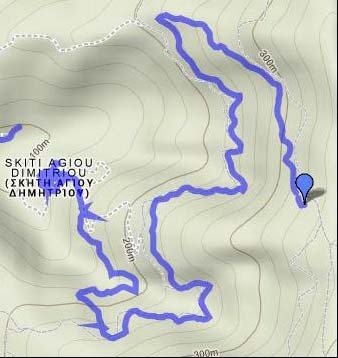 On the Zwerger map I could see that a path led upwards from the skiti Dimitriou, so we decided to find out if it still passable. 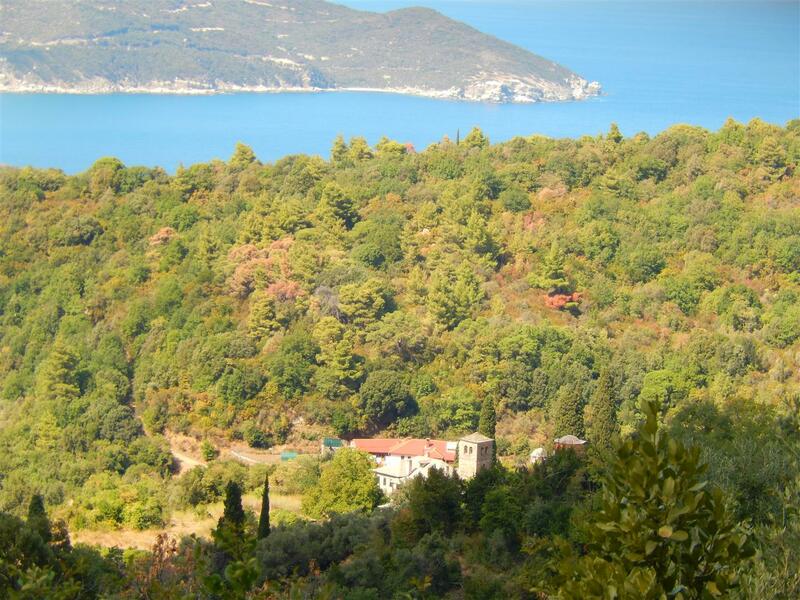 In the next 20 minutes or so we experienced how beautifull and the rough Athos nature can be, because the path was nearly overgrown. 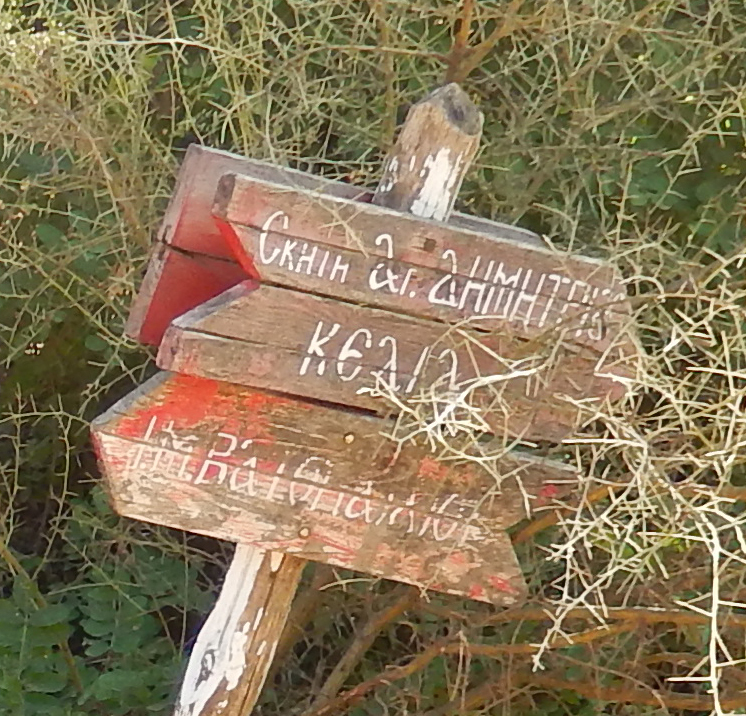 Just at the moment we were forced to return because of the dense vegetation, I could see a dirt road ahead, so we had to climb up the last 5o meters over fallen trees and through brambles. 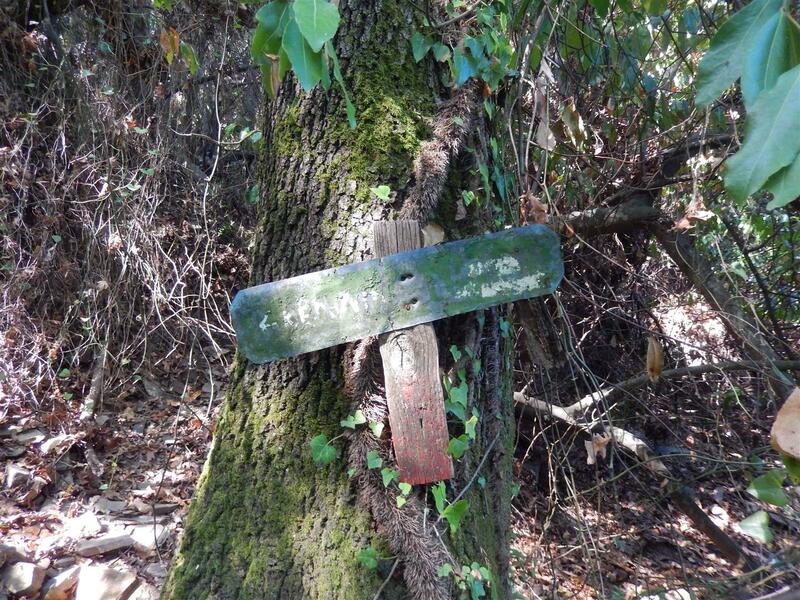 a sign along the overgrown monopati: Kelli … ? To skiti Ag. 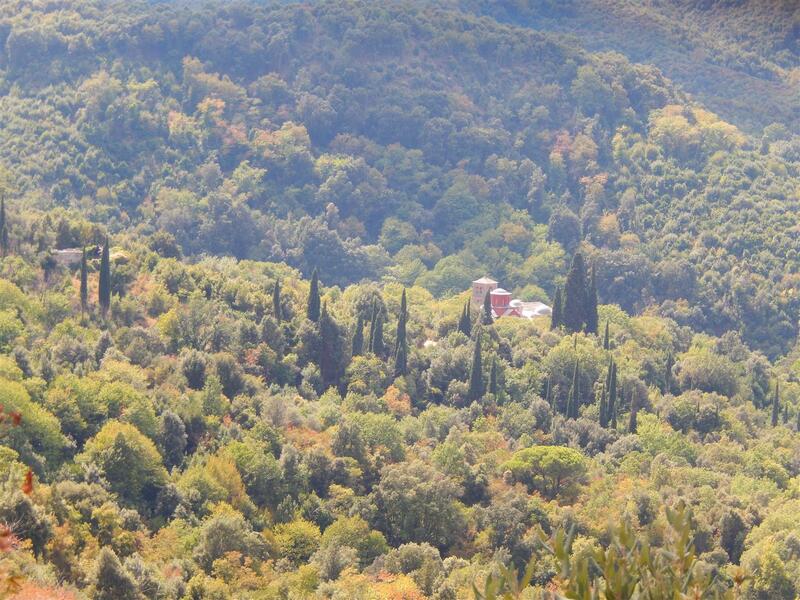 Dimitriou and IM Vatopediou: here our ways parted, I continued on my own to Bogoroditsa and ther other guys went back to Vatopediou. 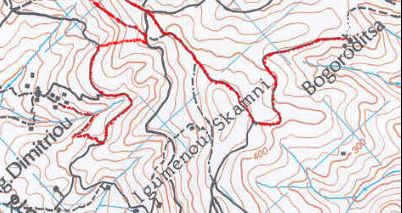 On the next maps you can see which route I took. 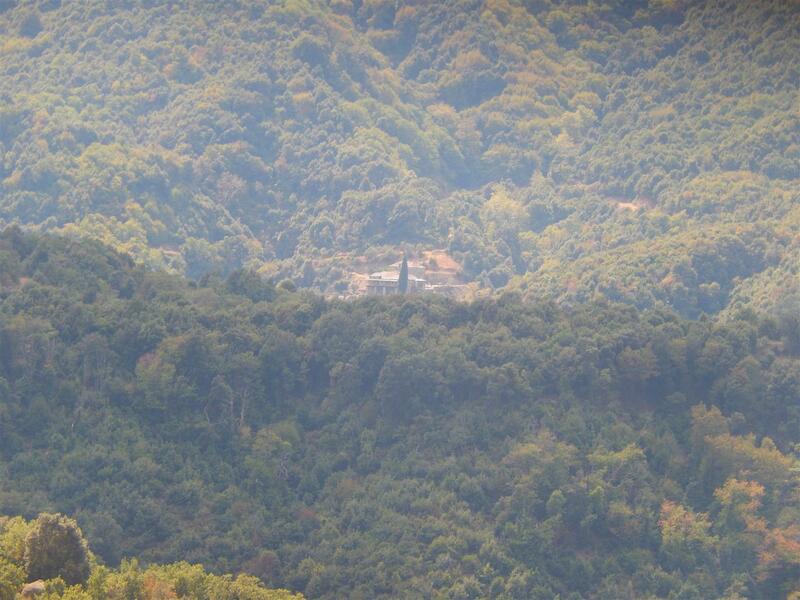 But first another picture from Skiti Dimitriou, this time from spot (3). 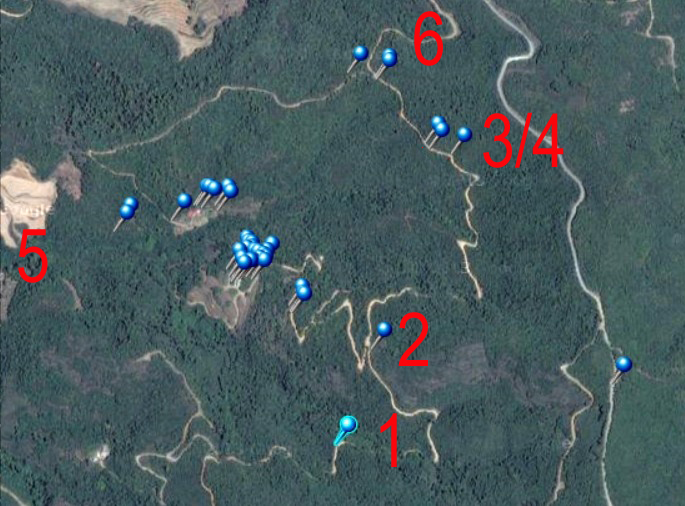 When pointing up the camera, you see another settlement, in the Google map-picture above it is near nr (5). 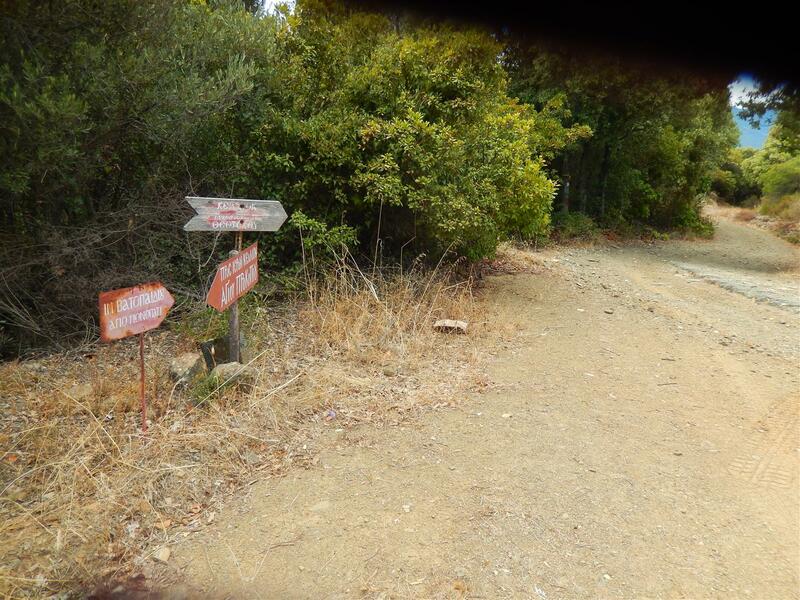 The photo is from (6), where the road splits and where the monopati to Vatopediou starts and a sign points to kellion Theotokou and (again) Prokopiou. Also at (6) and at the beginning of the monopati to Vatopediou you can find these (FoMA) signs. The last picture of this post is a beautifull example of an old monopati, it its original setting and undamaged. 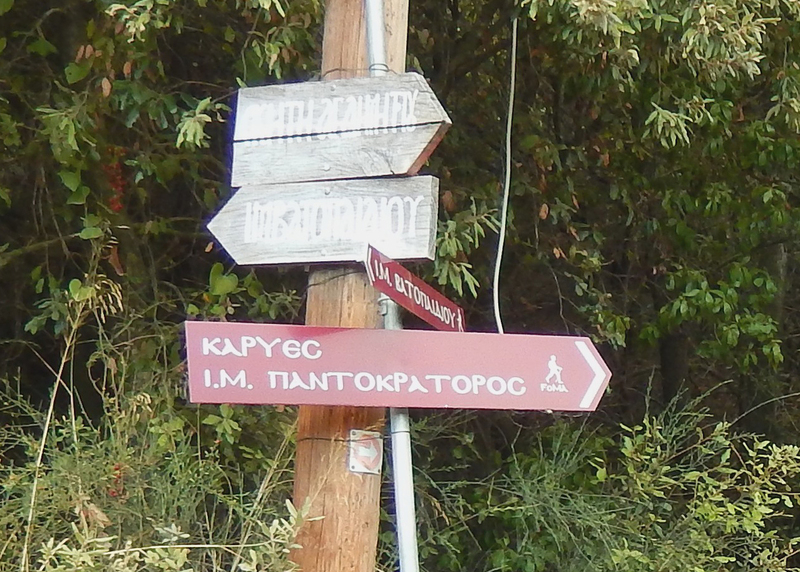 This entry was posted in Dimitriou, skiti, trip 2013, walking and tagged footpath, monopati. Bookmark the permalink. First of all, thank you for your interest and your involvement towards reviving these old footpaths ! 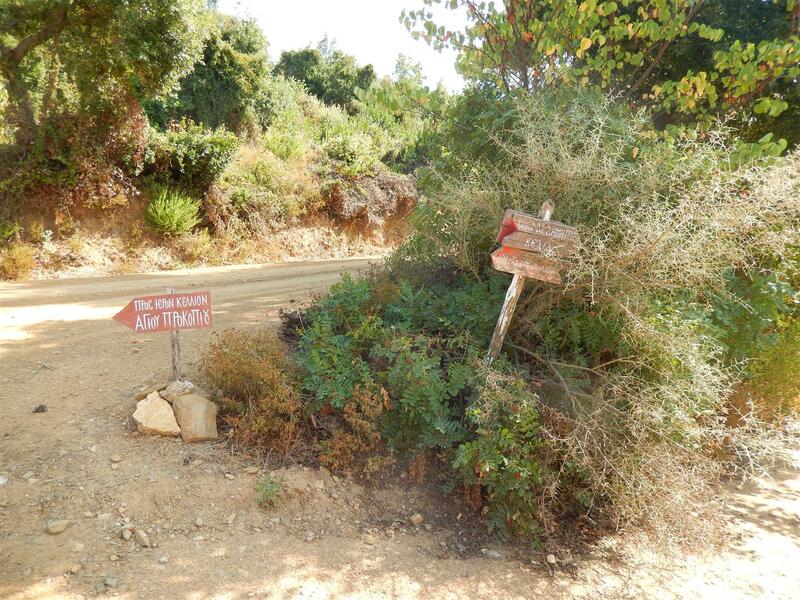 As a FoMA member, active in cleaning, describing and ‘GPS-ing’ the footpaths on the Holy Mountain, I can assure you that your help and support is greatly appreciated. As we, FoMA, are going back on duty next May, I’ll put this footpath, which was unknown to us, on our to-do list, as a major goal for 2014. 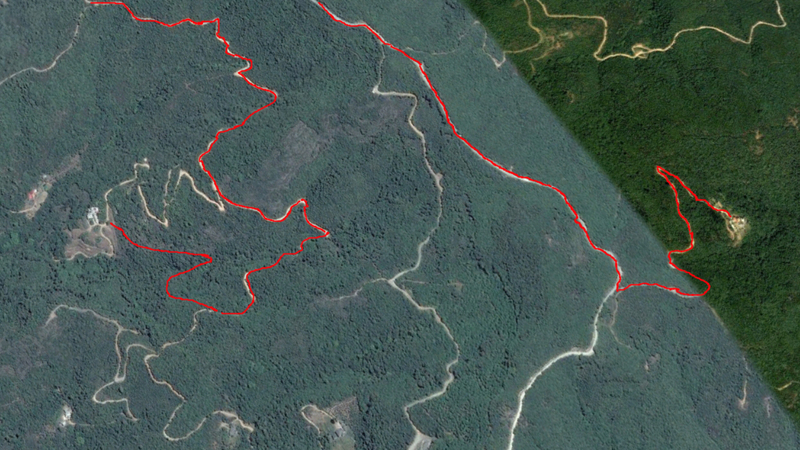 In order to do this in the most efficient way, would you be so kind as to send me your GPS-track ? That would really help us planning ahead. Also, if you happen to have other tracks of paths, or even bits of paths, that look almost lost and of interest, don’t hesitate to send them as well and I’ll make sure that, at least, an evaluation will be made as soon as possible about their state, usefulness, and possible schedule for re-enabling.